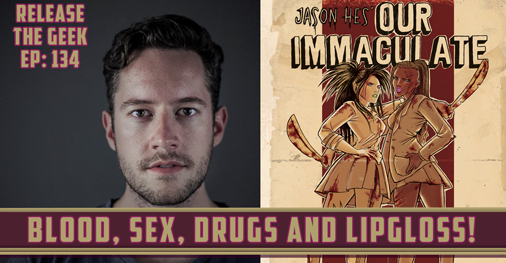 Episode 134: 'Our Immaculate' Geekery with Jason Hes! In 2016, we interviewed Kelan Gerrity from Sera Blue, a new age publishing company based in Johannesburg, South Africa. Kelan, a writer herself, offered a very interesting promotion - if you purchased a copy of her book, Crimson Skies, you could submit a story idea that Sera Blue would edit and publish for free. After a long and challenging process, due to the quality of the entries, Sera Blue declared a winner - Joburg based writer Jason Hes, for his horror novel submission, "Our Immaculate". We recently sat down with both Jason and Kelan to discuss Jason's path to geekdom, the competition process overall, and how Jason came upon the ideas that formed the basis of his horror story. "Our Immaculate" is now available at Skoobs in Montecasino, Johannesburg, or via the Sera Blue website! You can also follow Jason via his Facebook page!